About: The Arts Theatre Club opened in 1927, as a members club for thespians and literary figures. 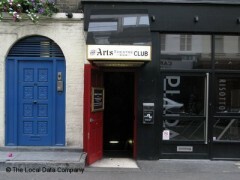 Today, still a members club, it can be found down some steps on Frith Street in Soho. "Glamorous basement drinking in Soho"
The Soho artist bar known as the Arts Theatre Club has had a makeover and since we're particularly fond of red velvet curtains, low lighting and cocktails in subterranean spaces, we're obviously going giddy for this one. Skirting just the right side of pastiche, this luxurious basement has all the appeal of old Soho - or at least an old Soho viewed through whisky and beer soaked memories mixed with the photographs of John Deakin. Lined with small tables, rowed up against the walls, plenty of space is left for you to show off your best impression of somebody who knows how to move to the kind of jazz and swing that dominates the speakers. With a piano against one wall and a carpeted and curtained stage area in the rear corner, it's clear that the Soho artist’s bar expects 'artists', so fingers crossed for impromptu music and post theatre performance. Open past midnight, this is one to add to your list of late night Soho drinking, a secretive spot in the same vein as the Phoenix or Trisha's. While the clientele, the music and the decor might hark back to bygone Soho style, the drinks list attempts to follow. Beer is by the bottle but cocktails are the chosen tipples. Now, while we've tasted better balanced drinks and we find the braces and trilby outfits donned by the bartenders a little unnecessarily contrived, the bar is giving it a go. This is by no means a cocktail bar you'd come to for cocktails’ sake but thrown in with the rest of the bar's evocative charms, the experimental menu - bacon bourbon old fashioned? - about wins us over. Go late, go to dance, to witness the Soho artists and go just to make sure they don't ever try and turn the Arts Theatre Club into a basement Wahaca's. The Arts Theatre Club opened in 1927, as a members club for thespians and literary figures. Today, still a members club, it can be found down some steps on Frith Street in Soho. Having recently been through a massive refit, the venue is now a haven of glamour and comfort, dark red walls, stylist seats, and shelves filled with old books, (but don’t attempt to read them unless you have a good knowledge of the Greek language, as the owners who originate from Greece appear to have emptied their collection here). However it wasn’t always this glamorous, and was once rather rough round the edges. I even had a bag stolen here on one occasion. Unashamedly retro, the Arts Club favours 80’s and 90’s music, however you will not find the likes of Kylie or Rick Astley here, oh no. The music policy includes The Smiths, New Order, Blur, Blondie, Echo & The Bunnymen, and the odd dash of Madonna, amongst many many others. In theory you can only really attend if you are a member, which costs £25 a year or is free if you’re a theatre or BECTU union member; however it is extremely quiet up until around 10 or 11pm. This solitude can work well if you’re trying to find a quiet place to talk in Soho on a Friday night, generally an impossibility. The drinks are expensive, at £4.50 for a small glass of house red. However Arts Theatre Club provides a different kind of drinking experience, with an older, perhaps more jaded crowd, good music, and a slight feeling of ‘luvviness’ is in the air.